A satisfying winter diet filled with veggies can be a challenge…. Sometimes, I need something warm, filling and rich that’s not soup. Something comforting and velvety in texture that can help me resist my cravings for calorie laden dishes like macaroni & cheese and mashed potatoes. Yesterday we talked about what a flexible ingredient ratatouille is. Today I want to show you my favorite lighter recipe and how doubling up each time I make it is one of the ways I preserve summer veggies for winter. I found my ratatouille salvation in Martha Rose Schulman’s great cookbook for beginners, Light Basics Cookbook. Sadly, this book is out of print – it’s packed with gems, tips and tricks – particularly to those new to the kitchen. But, used copies are still available and Martha keeps a helpful online archive of her recipes, so all is not lost. 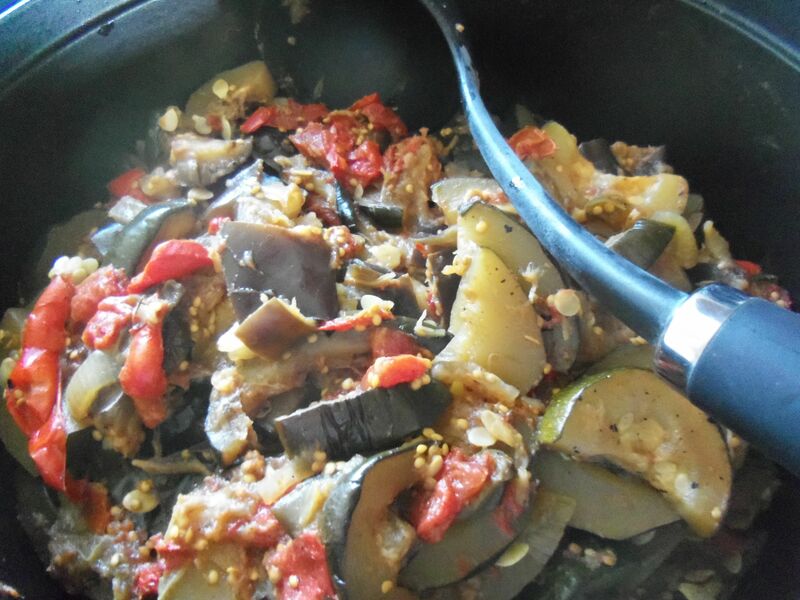 Here’s Martha Rose’s recipe for her less caloric version of ratatouille. Except for one thing. Martha’s online recipe leaves out one slightly fussy step that makes the book version of this recipe such a treasure. Sure, you can skip it and your ratatouille will still be good, but why stop at good when you can have fantastic? It’s only slightly fussy and the difference is well worth the effort. The trick is reduction. Making use of the power of reduction is one of the little-mentioned secrets of Kitchen Greats. 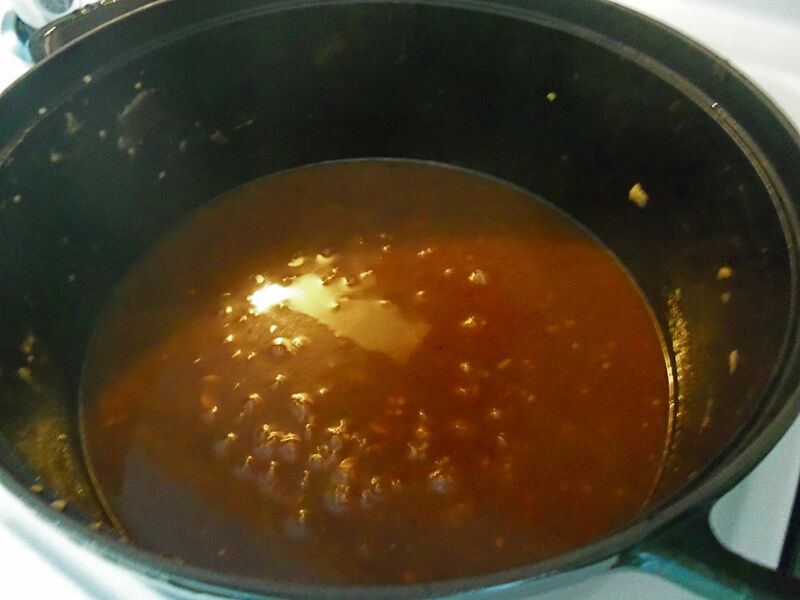 Simmering a sauce until the water evaporates concentrates the flavor and thickens the sauce without adding flour or thickeners. It takes just a little more time and attention, but can boost a recipe from good enough to amazing. A reduction intensifies the flavors of my rustic fruit pies. Pan seared meat served with sauce made from reducing the pan juices and an added liquid is rich and elegant. I don’t love floury gravy for my beef stew, brisket or short ribs either. Instead, why not remove the meat & veggies to the serving dish and reduce the sauce? So, how does ratatouille benefit from a reduction? Simple. After cooking, place a colander over a large bowl. and dump the ratatouille into the colander. The juices will drain into the bowl. Transfer the juices to a saucepan and return the ratatouille to the casserole. Heat the juices to a simmer. Try to keep your boil as gentle as possible – the harder the boil, the faster the reduction, but also the more the flavor is altered by temperature. 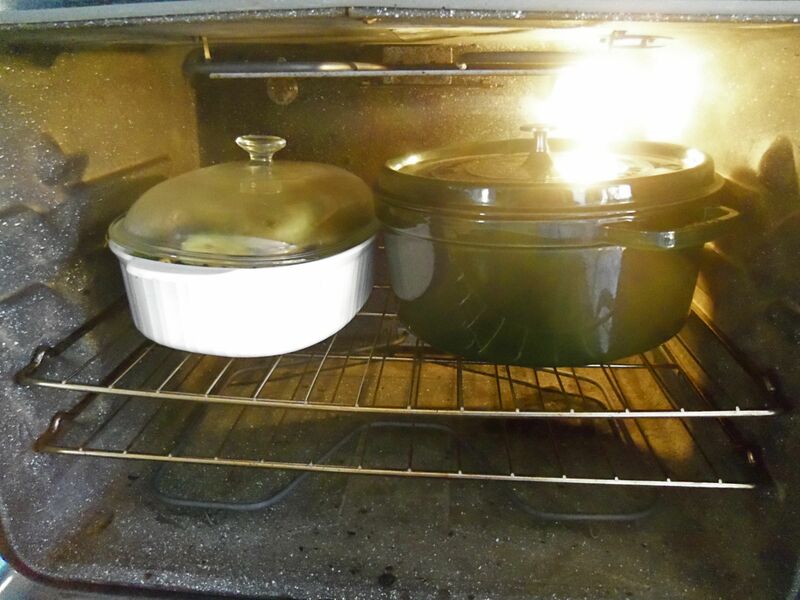 A slower simmer preserves the flavor. And, any seasonings will intensify after being reduced so adjust to taste after the reduction, particularly the salt. Reduce by half over medium-high heat, add your knob of butter if you wish (I wish you will), then stir the reduced juices back into the ratatouille. This is a dish that is even better made the day before. For best results, cook and refrigerate overnight. Next day, serve at either room temperature or warm. On seasoning ratatouille: I admit that one reason I didn’t love ratatouille at first is because it tends to be heavily herbed/seasoned. Call me crazy, but I really don’t care for that. Late tomatoes, peppers, garlic and onion have more than enough flavor without and some fresh basil added just before serving is just right for me. So, if you feel the same way or just don’t have the thyme and/or oregano, don’t let that stop you. The flavor without is every bit as delicious. If you’re going to make one ratatouille, why not make two and save some for later? When you’re done, take your leftovers, measure out the size you would be most likely to use at one time (if you aren’t sure, go smaller). Two cups per bag is my preferred amount. 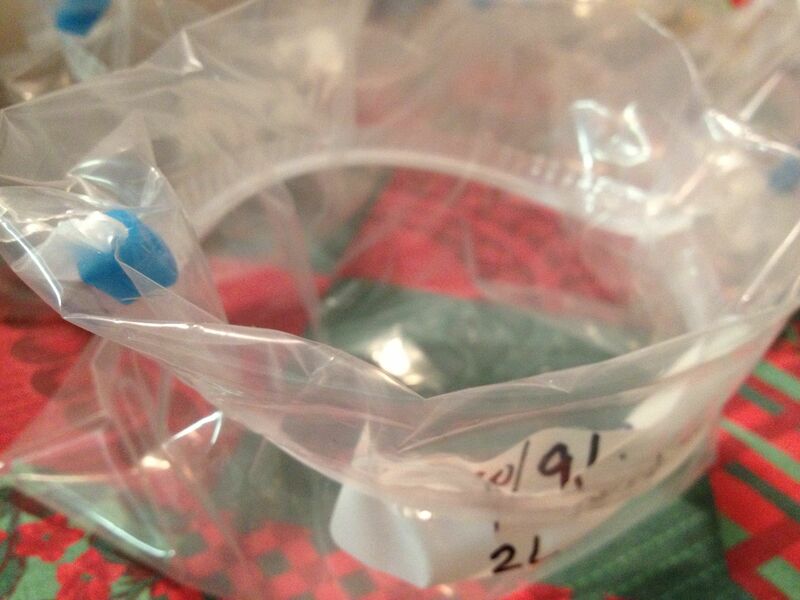 I prepare quart freezer bags by labeling them, rolling the tops down and standing them up on the table. You may be wondering, so here it is: there is no way to know in advance exactly how many bags you will need, so label cautiously. You could label after filling, but it’s really hard to write on jiggly filled bags and messy & difficult for marker to adhere to frozen ones. Carefully measure your rat into the bags, squeeze any air from the bag, seal and lay flat on its side on a baking sheet or flat plate. Carefully stack your bags so each lays perfectly flat. 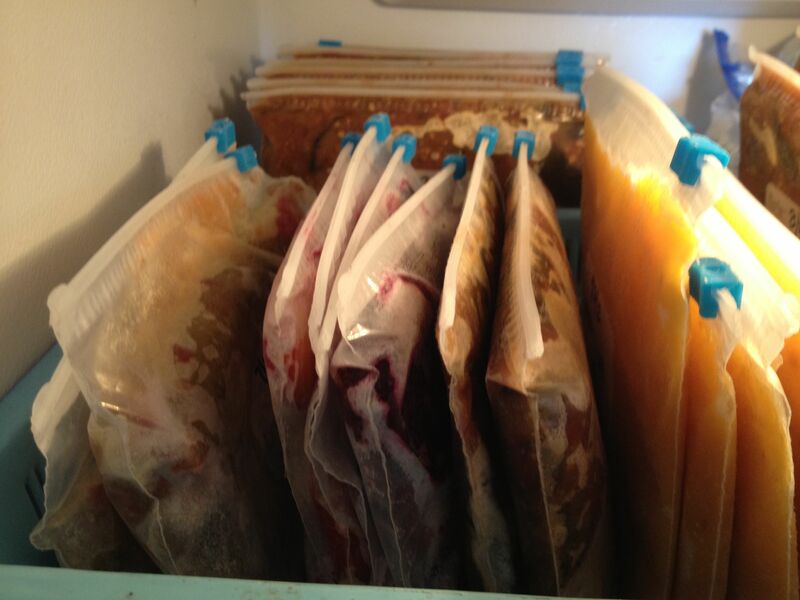 Place the stack of filled bags into the freezer, keeping as straight and level as possible. Freezing the bags flat on their sides on a plate or baking sheet is an important detail. Skip it and the weight of the liquid will cause the contents to sink around the freezer racks. The bags will become entwined around the racks, then freeze that way making it impossible for you to remove them from the freezer or stack them neatly. Next day, when your bags are frozen solid, you can stack them upright to save space. Plastic organizers and large freezer containers help keep everything tidy, visible and help you squeeze more in. The more tightly packed your freezer, the more efficiently it runs. Do this all summer and you’ll have a virtual library of preserved “books”. What kinds of garden goodness is in my library? Pumpkin puree, fresh tomato sauce, squash, ratatouille, roasted beets, beet greens, cantaloupe puree, shredded zucchini, rendered lard and plum pie filling.